It's actually the largest flash drive Victorinox has created in terms of its physical size too, but it's still very easy to slip in a pocket or tether to a keychain. It's not like they just slapped their shield logo on an external hard drive and attached a pop-out blade. 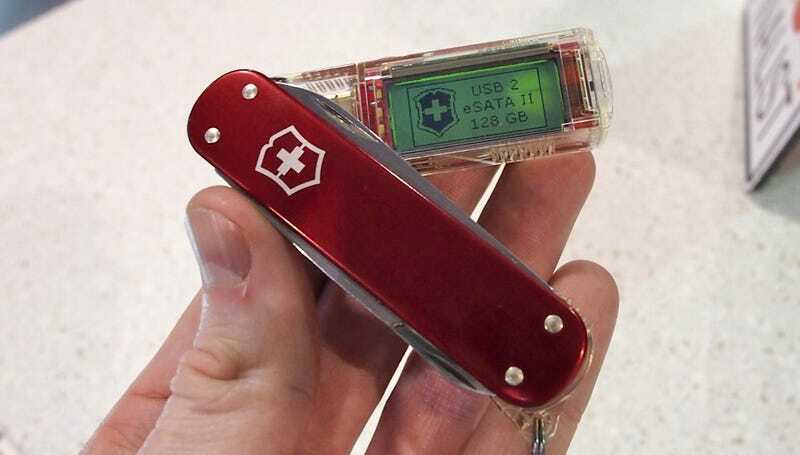 Read and write speeds are promised at 220MB/s and 150MB/s respectively, and from my personal experience Victorinox's drives have been some of the fastest I've ever used. I particularly like that the connector is both USB2.0/3.0 and eSATA compatible, keeping its form factor simple and maximizing transfer speeds. Perhaps a Thunderbolt option might be in the works down the line? And that monochromatic LCD display you see isn't just limited to showing you how full the drive is. You'll actually be able to put a custom message on there, or an incredibly low resolution photo if it suits your fancy.